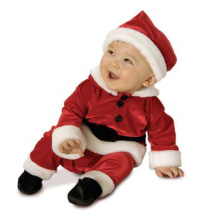 Santa Claus certainly doesn’t have to worry about Friday The 13th and all the bad luck associated with it. This is due to him being a Demi-Angel, and Angels are even luckier than Leprechauns! There’s also the fact that his sainted North Pole City is a bastion of good luck. It’s one of the top good fortune centers on Earth. Second only the Capital Of Good Luck and home of the Leprechauns known as Lucky Lake. The largest natural wishing well on the planet. There are also various enchanted energy centers around the world related to the heart of our world Goddess Gaia Mother Earth. 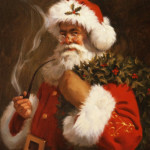 Here we will post any future updates related to Santa Claus and anything he did on this dark luck day. While taking his sleigh on a test run on the night of Friday The 13th in 2013 a most disturbing cry for help crept into Santa’s mind. Being part Angel he can hear prayers or pleas for help from a great distance. Since many humans are in pain he has to block them out. Only a high-level God can take the mental pressure of bearing the emotional anguish of all souls! There’s also the fact that he is bound to some extent by the selective non-interference policy of Heaven and of course the Supernatural Secrecy Pact. 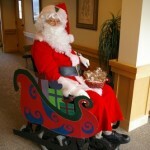 However, Santa has been known to carefully violate both when it comes to saving human lives! On this night he heard a couple in bed literally paralyzed in fear as the Friday The 13th Demon Specter attacked them. A Specter finally eradicated in 2015 with a little help from us here at Mystic Investigations. 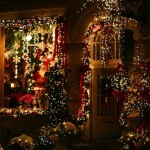 Santa immediately landed his sleigh on the couple’s roof and entered the house via chimney shimmering. Once inside he rushed upstairs to check on their son and daughter sleeping silently. Luckily the sinister specter never bothers kids as their innocence is too much for his pure evil to bear! Santa tried to enter the parent’s room but the door was supernaturally sealed shut even under his immense angelic strength. He then employed Enochian angel magic to burst through the door in a blinding holy light that caused the foggy black specter to actually scream and scatter briefly. Almost instantly the black smoke transformed back to its vaporous skeletal form complete with glowing crimson eyes. It floated toward Santa while sending forth wayward waves from its body that were the usual dark metaphysical energy to instill fear and pain. 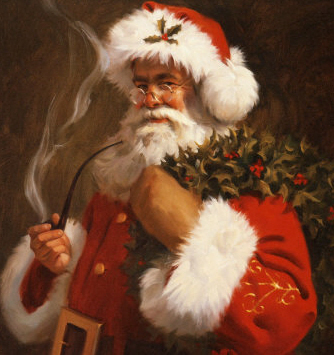 Santa swallowed and inhaled the dark vapors while smiling. Although he burped and said,”Excuse me Rudolph eyes!” The Specter wasn’t amused and threatened,”I don’t know what manner of entity you are but your death is at hand!” Santa chuckled,”Ho ho ho leave this innocent family alone and be gone you blasphemous beast!” The Specter screamed in anger and turned into a tornado engulfing Santa Claus. Santa inhaled the entire Specter and then froze with eyes closed as an internal mental battle took place. Within Santa’s mind, the demon and demi-angel appeared to engage in a good old-fashioned fist fight. As they fought Santa attempted to turn it’s dark metaphysical matter and energy into that of angelic light. 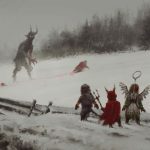 The demon was merely trying to kill Santa! 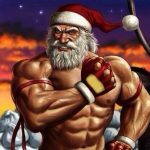 However, every cell in the Great Claus’s body was bright with energized holy light! 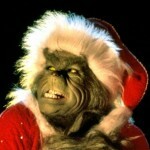 So he focused most of his power on possessing Santa’s mind. Despite his efforts, the demon saw nothing but strength, good cheer, and justice dancing amid sugar plum fairies. There was nothing to exploit in this holy man’s mind. The demon was trapped as he felt every fiber of his evil being succumbing to Santa’s awesome power! In a last-ditch attempt to escape he coalesced into a dense ball in Santa’s lungs and caused a gargantuan cough followed by a super sneeze that blew a huge hole out the side of the house. The Specter flew away into the dark starry skies to heal before haunting humanity again. 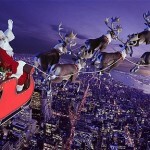 Santa was weakened to an extent and couldn’t go after him. Rudolph saw the demon fly off and declared,”Holy Cow!” Thankfully, the couple in bed was out cold from the demon and would probably assume it was an odd shared nightmare. That is after Santa and an Elf in the sleigh repaired the wall. They then left and returned to the North Pole to recuperate and reflect on the horrifying incident! Santa is on vacation with Mrs. Claus, and family after his hard work delivering Christmas gifts. 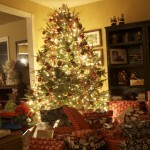 This includes the annual battles against the Anti-Claus as he attempts to derail Christmas. The Claus Family is traveling about North America on a road trip in an RV. The entire trip was delightfully uneventful in a supernatural sense! Every so often Santa wants to live like a human and have his seemingly perpetually young kids experience a normal childhood as well. 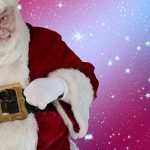 Today on Friday The 13th, 2012 Santa Claus is at CES, The Consumer Electronics Show, at the Las Vegas Convention Center in Las Vegas, Nevada browsing new high tech Christmas gifts for future holiday seasons. Naturally, he keeps a low profile outside of the Christmas season so he’s traveling incognito under the name Kris Kringle. He dyes his hair brown and trims his beard short. In addition, he wears normal clothing although he tends to mostly wear red, white, and sometimes green clothes. There have been no reports of bad luck at CES most likely due to Santa milling about the crowd spreading good cheer. Usually, a few Gremlins like to show up to mess around with the gadgets. 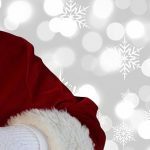 If you feel a vibe of goodness from a bearded man and think you’ve known him all your life then you may have in fact had a rare brush with old Saint Nick! Santa’s battle with Jason Voorhees amid the Halloween season. To be written about at a later date. 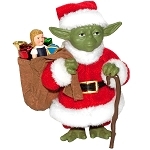 Santa saves an innocent man from making a dark deal with a Clurichaun, aka evil Leprechaun. This entry was posted in Demons, Santa Claus and tagged Bad Luck, Friday The 13th, Friday The 13th Demon Specter, Horror. Bookmark the permalink.